Market2Lead was one of the early Marketing Automation vendors. Actually in 2006, when I was a marketing manager at a software company in San Francisco, I selected Market2Lead as our Marketing Automation system. But since then too little progress was made: the product was good, but their marketing was lagging behind. The result: not enough new customers. Selling the company to a well-known software company may be a very good outcome for Market2Lead (speculation, I have no inside information on this). More and more I’ve come to believe that great marketing initiatives go bad if marketing and sales don’t have a productive relationship. A Marketing Automation system either needs to have great connection to the CRM system, or it should all be integrated. Oracle clearly takes the integrated approach (as they always do), and I believe this is a good move. I publish a list of all Marketing Automation vendors. There are over 30 vendors on this list, which is way too much. There isn’t enough business in this market to support so many vendors. So one fewer vendor – although always sad for the individuals involved – is not a bad thing for the market as a whole. Most Marketing Automation companies are relatively small. Even industry leaders like Eloqua and Unica are relatively small compared with vendors in more established software categories. This is the first serious Marketing Automation initiative by a major software player. Other CRM vendors claim to do Marketing Automation, but I believe those claims are unsubstantiated. So the Oracle move shows that Marketing Automation is becoming a mainstream solution. It seems that Market2Lead is migrating their customers to other solutions, at least, Eloqua’s announcement gives that impression. According to the Oracle’s announcement, only the IP has been acquired, not the company. The fact that the Market2Lead’s installed base is relatively small is a good thing: major disruptions can give a market a bad name, and that’s the last thing Marketing Automation needs. More on a product-level, Oracle is getting their hands on a very feature-rich product. Having done a lot of work with Market2Lead myself, I know first-hand that it’s a very powerful system. This is a good fit with Oracle’s main customer base: mid-size to large companies. There is also a good fit from a technology perspective. The Market2Lead product has been developed using the Java programming language. That is not one of the most hip languages such as PHP or Ruby, but it’s the primary technology at Oracle. Oracle has been a Java-company for a long time, and after the Sun acquisition they also own the Java technology itself. It should be reasonably easy to integrate Market2Lead code in Oracle applications. I think this deal signals the beginning of a 3-5 year long consolidation process in the Marketing Automation industry. The winners will have tied their applications into other vital marketing and sales processes, either through integration or through acquisition. So my advice for marketing practitioners is to hedge your bets: your Marketing Automation vendor may not be around anymore in a couple of years. This entry was posted in marketing automation and tagged acquisition, CRM, eloqua, market2lead, oracle, unica on May 25, 2010 by Jep Castelein. 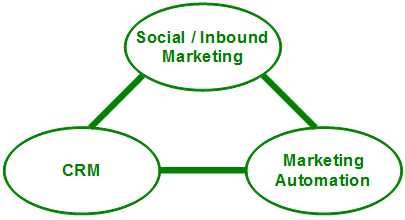 Both CRM and Marketing Automation are changing because of Social Media and Inbound Marketing. It plays out in a slightly different way for each of them. CRM is very broad, it’s not just about sales, but about pretty much anything that involves communicating with your customers. For now I’ll focus on the “sales” part of CRM (Sales Force Automation). Some of the new social CRM features help sales people identify more opportunities, get more background information on existing leads and facilitate intra-company collaboration (see earlier post). This all revolves around leveraging connections with other people, whether that’s other sales people who share their contacts (like with Jigsaw or Netprospex), a sales person’s own network (LinkedIn) or co-workers within the same organization (Lithium). Marketing Automation used to be focused on capturing leads, adding them to an email nurturing track, and giving them a score that indicates when they are sales-ready. Social Media doesn’t change anything about that: capturing, nurturing and scoring simply isn’t very social. The big changes are in the phases before and after this. Before – Social media is great way to get in touch with new prospect, in addition to the more traditional approaches like advertising and list buying. But it’s a lot of work to monitor all online discussions and contribute if needed: marketing automation could play role in automating this. I won’t automate great content, but at least it can take care of the logistics. After – Once leads are sales-ready, they are passed on to the sales team. Unfortunately, in most organizations this process isn’t very well organized. That’s too bad, because this is the most important collaboration point between marketing and sales. The eternal source of discontent is about lead handover: sales says the lead quality is lacking, and marketing claims the sales people don’t follow up properly. Better social collaboration options can improve this situation. Increasingly I believe that Marketing Automation should be seen as part of CRM. Sales & Marketing alignment is so important for the success of Marketing Automation that you can’t see it separate from the system that is used by the sales teams. Even though automation of social media participation may be the hottest topic, the most immediate benefits from “Social” come from better collaboration between Sales & Marketing. This entry was posted in marketing automation, Social Media and tagged Inbound Marketing, social crm, social marketing automation on May 5, 2010 by Jep Castelein.